Fully equipped to carry everything you need for a comfortable day's skiing, the Salomon Side 25 also employees ski carriage straps enabling you to hike to hidden backcountry descents. The Salomon Slide Ski Backpack's multi-purpose design provides carrying comfort, stability and organiser pockets that cross over perfectly to year-round everyday use. The Salomon Slide 25 Backpack has an adjustable strap system to attach skis or snowboard for stable transportation whether you're just finding your powder legs on low angle slopes near the piste, or if you're making your way to a stunning backcountry descent back to resort. And if you prefer to stick to the pistes, the ski straps can be very useful for longer walks back to the chalet after a full day of blasting down the groomers. Sized to accommodate a couple of additional layers and a packed lunch, the Salomon Side 25 Ski Backpack has a spacious main compartment that also holds a ski helmet, a large front zipped pocket, and for the rest of the year there's a useful internal laptop sleeve. The Salomon Side 25 Ski Backpack has a top zipped pocket that takes care of ski goggles and helmet, while the exit point allows the use of a bladder system, ensuring you stay fully hydrated. 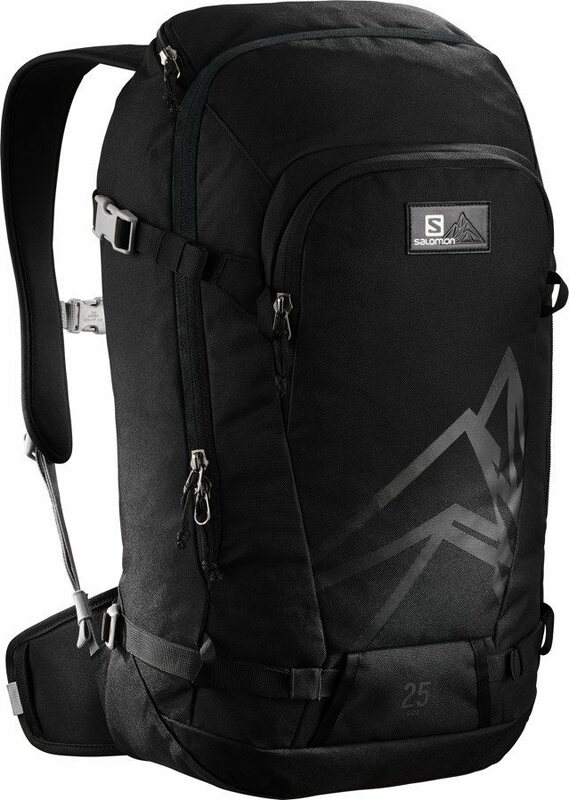 Transport your load in comfort with the Salomon Side 25's padded back system and adjustable padded shoulder straps. Maintain stability on long turns full of energy or on agile mogul field descents with the Side 25's adjustable, padded hip belt and variable sternum strap. An effective multi-tasker, the Salomon Side 25 Ski Rucksack offers plenty of versatility both on your ski holiday and back home too. Comfortable to carry for on piste skiing, the Salomon Side 25 has enough space to carry extra layers, ski helmet, spare gloves, sun cream and lunch, yet is sized to be simple and unobtrusive to use both on ski lifts and descents. Its ski attachment straps allowing you to access backcountry routes that require a hike in.